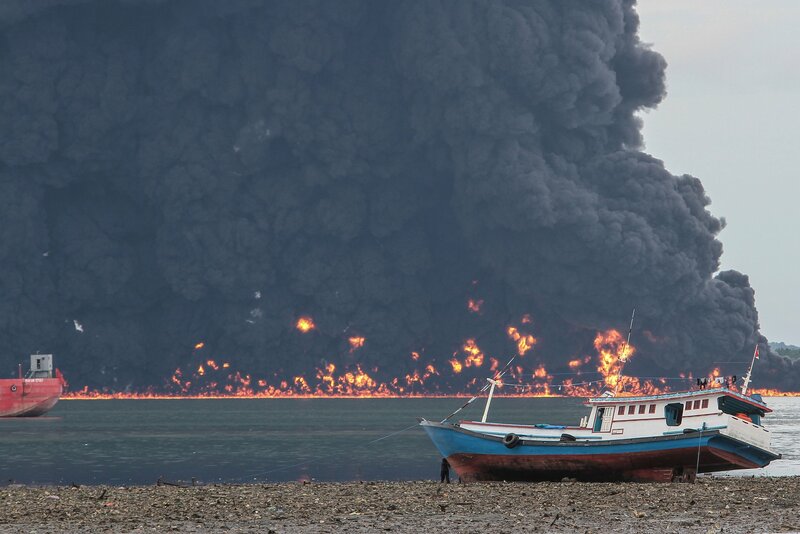 “We believe this is the worst oil spill to catch fire since the 2010 Deepwater Horizon disaster,” said Fathur Roziqin Fen, Director of WALHI East Kalimantan. WALHI is Indonesia’s largest environmental organisation and is closely monitoring the consequences of last week’s large oil spill in Balikpapan Bay, Borneo. “Over 130 square kilometres of sea are covered in oil,” Fen told me. Five fishermen have been killed, Irrawaddy dolphins are dying, at least 162 fishermen have lost their livelihoods, 17,000 hectares of mangroves are at risk, and crab farms worth billions of Rupiah have been destroyed. The Indonesian Government has distributed masks around the city and asked residents not to light cigarettes near the bay. Pertamina, the state-owned gas and oil enterprise that owns a pipeline in the bay, initially denied that the oil was theirs and claimed test results indicated it was motor oil. Ten tests later, the company finally admitted responsibility. It turned out that part of the pipe, located only 25 metres under the sea, had somehow moved 120 metres from its original location. “The sea pollution is so bad and we’ve lost our livelihood,” a fisherman told the ABC. “I’m standing on the coast and the smell is so strong it’s giving me a headache.” WALHI says more than 70% of Balikpapan Bay has been covered in oil. Stretching some 54,716 kilometres, Indonesia’s coastline is the world’s second longest, after Canada’s. Coastal communities not only have to deal with sinking shorelines, salinisation of rice fields and vegetable plots, and natural disasters such as tsunamis, but also with poverty, health, food shortages, and unemployment. A large oil spill can severely compound these challenges. In 2011, almost 15 million coastal dwellers – approximately 6% of Indonesia’s total population – were deemed poor or very poor. Many of them live alongside major shipping routes, such as the Makassar Strait where Balikpapan is located, and must contend with contaminants from cargo ships as well as gas and oil rigs. Pertamina’s oil pipeline is not the only extractive project in the Makassar Strait. In mid-2017 a gas rig opened that pipes its product 80 kilometres to Bontang, north of Balikpapan. In Indonesia, living beside the sea is not a sign of wealth like it is in countries such as Australia. Marine pollution and its impact on ocean life represents a major threat to coastal communities. In coastal Indonesia, a meal often consists of a heaped plate of plain rice and a fried fish. For most, seafood is the only animal protein they eat because chicken, beef, and goat is too expensive. Without access to fish, shellfish, and crustaceans, many coastal people’s diets would likely consist entirely of carbohydrates. Indonesian companies don’t exactly have a great record of managing the environmental impact of extractive industries such as oil, gas, and mining. The Freeport gold mine in Timika, Papua, reportedly dumps as much as 200,000 tonnes of waste into the local rivers every day. Locals claim the waste has raised the height of the riverbed and caused fish, oysters, and prawns to all but disappear, despite Freeport-McMoRan spending US$15.5 million annually to reduce the mine’s impact. On the other side of the country, in Sidoarjo, East Java, the drilling of a gas exploration well has sent boiling mud flowing across villages since 2006, killing 13 people and displacing as many as 60,000 residents. While the 2009 Environmental Law states that polluters must be responsible and pay for any environmental damages caused, in practice this has been hard to prove in court and harder to implement. The Sidoarjo mud flow, for example, not only displaced tens of thousands of people, but also contaminated rivers with cadmium and lead. While cadmium causes renal failure, lead damages the brain and nervous system, meaning its long-term impact on residents is unclear. The government ordered the mining company, PT Lapindo Brantas, to compensate victims in 2007, but 11 years later many are still waiting. Others only received payouts because the central government loaned Lapindo the money. 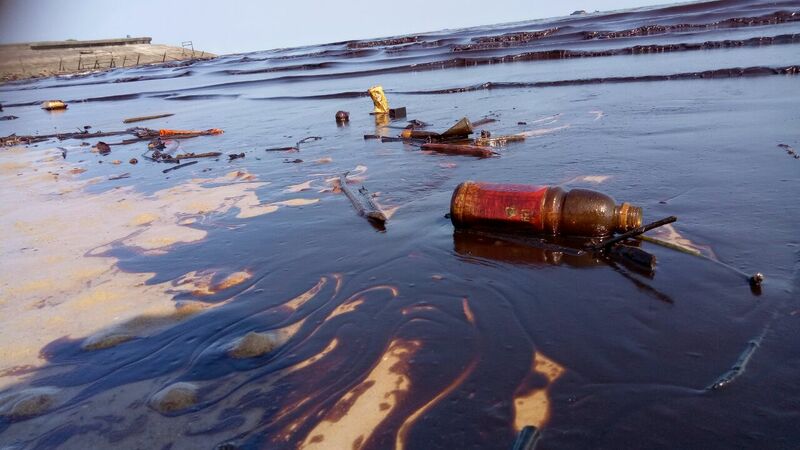 President Joko “Jokowi” Widodo said in 2016 that “it is our responsibility as citizens of the world to preserve the oceans”; however, WALHI claims that this is not the first oil spill to occur in Balikpapan Bay – an earlier spill in May 2017 received little attention. As with many environmental issues, it appears there is a disconnect between the government’s words and its actions. Indonesia recently vowed to reduce plastic waste, but this will only solve one element of marine pollution; the country is simply too focused on achieving food and energy security and becoming one of the world’s 10 largest economies by 2030. Indonesia must realise that economic success comes at an environmental price that might be too high.